Welcome to the waste lands, the land of the free to shut up and not to skate. According to Bordertown Blog, the construction of Bordertown skatepark first began in 2004 with a simple plan to make a ramp out of concrete in West Oakland, California. It was, as all other DIY parks start out, self-funded and engineered from the beginning by dedicated local skateboarders. Because there was no skateparks in Oakland, Bordertown quickly gained support from local skaters and residents alike in the Bay Area. But in August 2005, CalTrans shut down the park (they cleared the skate park subsequently), intending to demolish it entirely next week. Wasteland Skatepark was tore down yesterday. Photo Lady Hawk. 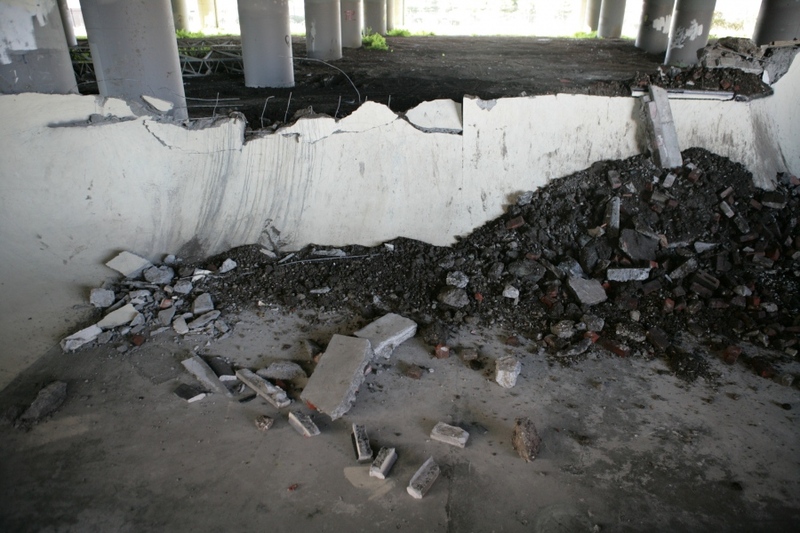 Another Oakland-Emeryville skate park, Wasteland, was demolished yesterday. “We seek your cooperation in the preservation, and public access of the newly constructed skateboard park underneath the 580 maze west, adjacent to wood street and beach street.” Wrote Alexander Fatemi in an online petition that got so far 2500 signatures. But the petition had no power against the Dump trucks, bulldozers and sweepers that were all up and running underneath the Macarthur Maze 8 a.m. Thursday destroying the Wasteland Skatepark. Caltrans said the city of Oakland gave up the lease and skating at park was considered trespassing. "The harm in letting it go is that number one it sets a precedent, and number two there are liability issues, and there are crime issues, homelessness issues, all sorts of issues that arise," said Caltrans spokesperson Bob Haus. Officially, Caltrans said that they closed the skate park because of liability problem, but in the background, they are already negotiating with a billboard company for the land. 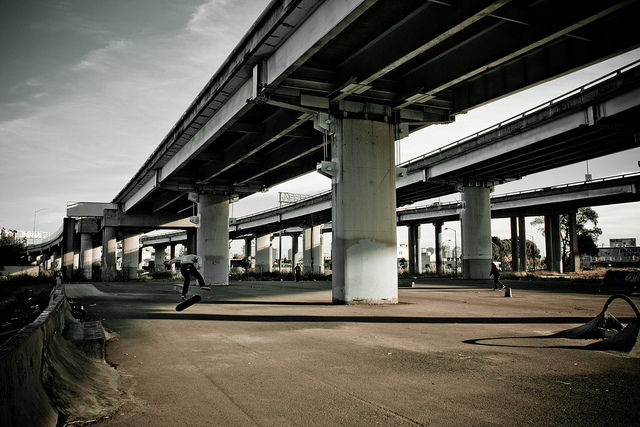 Caltrans actually wanted $5,000 a month from the skateboarders to keep the park open. Of course that’s a lot of money, especially for a place under a bridge. Shattered Dreams. Picture by Bordertown skatepark. The skateboarders were making good use of a wasted land and since skateboarders have limited resources and no time or resources to gather donations, the department never expected them to be able to pay a $5,000 monthly lease and it was doomed from the start. Greed, Lack of responsibility coupled with a typical "Not In My Backyard" mentality made eviction irreversible from a place that was safe for skaters. When Alexander Fatemi was asked by ABC7 News where he would skate now, he said he would take his board to the streets, where the cops are roaming. 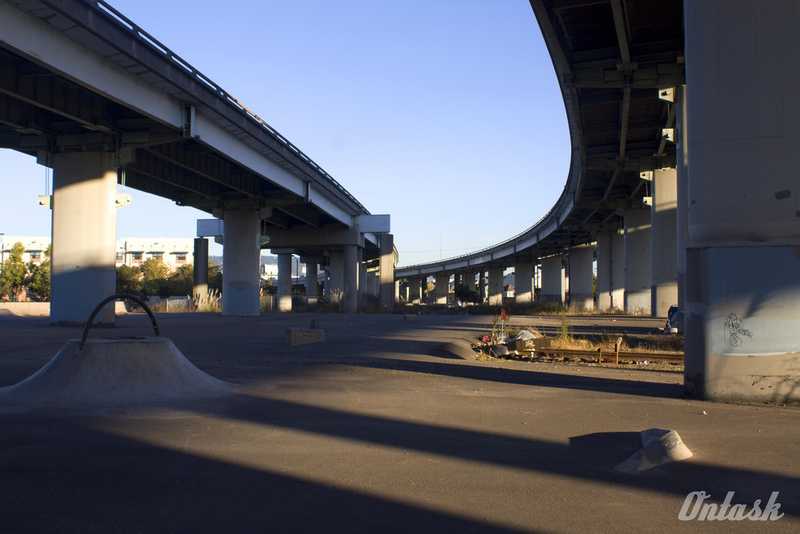 Bordertown Skatepark was located in West Oakland and was the first skatepark to open in the Oakland area. Unfortunately, As of July 2010, you cannot skate in the park. The skateboard park at the Rainbow Recreation Center opened March 31, 2008, in honor of the Cesar Chavez holiday in California. It is a smaller skatepark constructed on a former tennis court, but it has grind boxes, a quarter-pipe and half-pipe. The park is open from 10 a.m. to 9 p.m. on weekdays and noon to 4 p.m. weekends. Admission is free. The Alameda Skatepark is a 15,000 square foot concrete park located on the site of an old U.S. Navy base. The park boasts a wide assortment of bowls, ledges, barrels and boxes for skaters to ride. The park offers free entry and a view of the San Francisco Bay. All riders must wear protective gear. This Berkeley skatepark is the most developed of the Oakland area skateparks. It is an 18,000 square foot outdoor park with a variety of concrete bowls, ramps and flat courses for skateboarders of various skill levels. The park is open 7 days a week and is free, but riders must wear protective gear including helmets, knee and elbow pads. A drawback of this park is that it frequently closes due to hazardous materials seeping into the park, so riders should call ahead. To see more picture of the R.I.P Wasteland skate park, go to Lady Hawk website.